Rents in North Brooklyn are falling more than a year before the L train is set to shut down between Brooklyn and Manhattan, according to StreetEasy. That creates a bargain for people who are willing to make the trade-off for a longer commute. Sales prices aren’t falling. But it’s taking longer for houses to move off the market. The impending L-train shutdown is a bargain or a curse, depending on how much of a hellish commute New Yorkers are willing to endure. Starting in April 2019, the tunnel through which the L train runs between Manhattan and Brooklyn is scheduled to be closed for 15 months to repair damage caused by Hurricane Sandy in 2012. In North Brooklyn, which includes the neighbourhoods closest to Manhattan like Greenpoint and Williamsburg, rents fell in February for a seventh straight month, according to the online real-estate marketplace StreetEasy. Its rent index fell to $US3,027 in February, down 0.6% year-on-year and 2.2% since last August, when rents peaked. The average rent is now at its lowest since April 2015. That kind of rent slump is not unique to Brooklyn; in Manhattan, landlords are offering multiple concessions such as a free month of rent to fill up vacant apartments and energize a softening market. In Brooklyn, however, the L train adds a new layer of urgency: New leases signed in April will overlap with the start of the shutdown. 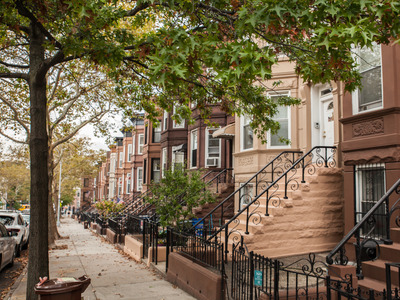 Grant Long, StreetEasy’s senior economist, said landlords were getting more liberal with discounts to try to encourage tenants to live in North Brooklyn for more than a year. “Renters should consider the reality of limited transportation to these areas, but there are bargains to be had if that’s a trade-off they’re willing to make,” he said. Meanwhile, sellers in North Brooklyn aren’t making such concessions. StreetEasy’s price index rose by 3.3% year-on-year to $US1.1 million. Since buying is a longer-term commitment, this countertrend shows home shoppers are betting neighbourhoods like Williamsburg will hold their appeal during the subway repairs and long after they’re complete. “That assumes a lot of these great businesses that embody that neighbourhood – the bars, the restaurants, the unique, cute little stores – are all going to be there on the other side, and are going to be able to withstand that change in the nature of the neighbourhood from a place that’s really easy to get to on a Saturday afternoon to something that’s a little bit more challenging,” Long told Business Insider. New York’s Metropolitan Transportation Authority plans to increase service on alternative routes to the L train, including the G, J, M, and Z lines. But even as bits and pieces of the MTA’s century-old technology are upgraded, riders are frequently subjected to delays and overcrowded trains.